Food Branding and Packaging for Greenspace Brands. Advertising, packaging design, web design, and tradeshow design. 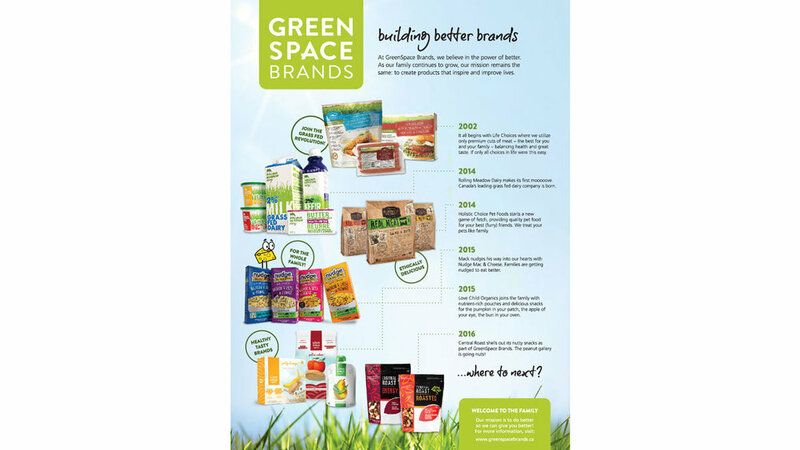 With a mission to create products that inspire and improve lives through healthier food options, GreenSpace Brands was born. They have created something special by not only building better brands but by building better relationships with retailers and consumers; doing so through involved engagement of both groups at levels never before seen. Five consumer and one corporate brand in 24 months is proof that their vision has been sound. Adding to that an IPO and a TSX stock listing, their timely response to consumer needs is proof that they have achieved their mission, and that we have achieved ours by helping to build solid brands.